Well here’s a thing, a fourth completion in four months… really this is not the speed I usually work at, think ‘mein Frau’ is adding something to my ‘English Breakfast Tea’ ! 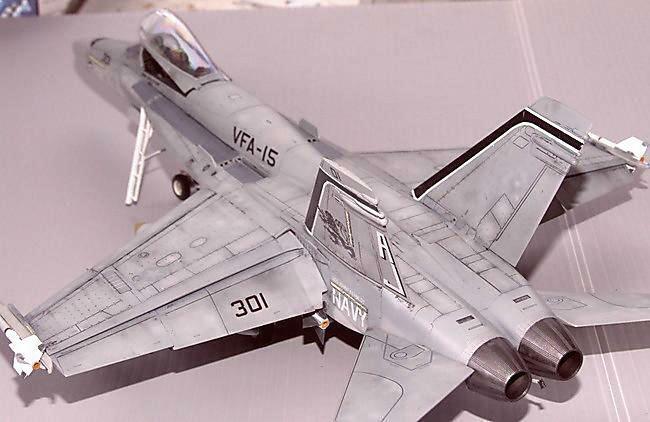 Hobbyboss’s F/A-18 isn’t without its’ faults:- there’s no transparencies for any of the nav or running lights, the cockpit detail is undersized and at best ‘generic’, but it builds and fits like a dream – the gear sub-assemblies require a degree in mechanical physics to build but they’re massively strong and just drop into place once done. I’ve built many, many USN projects (three recently) but tackled the TPS only a couple of times. For this I went all-out with pre & post shading, a ‘Flory’ wash, a pin wash, oil-dot weathering all on top of a multiple grey mottled paint job. And with all those layers I have to say it’s one of the best paint jobs I’ve done. I’m absolutely ‘over-the-moon’ with the final result. 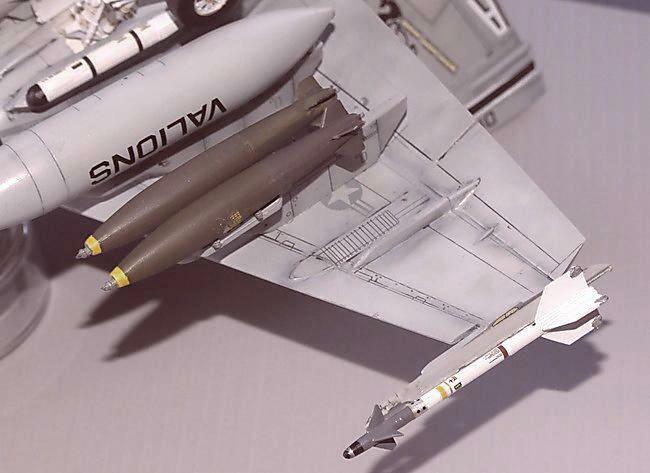 CAM & Aeromaster decals and a Quickboost resin seat are the only ‘extras’, the loadout came from the spares box and Hasegawa Weapons Set ‘B’, and is entirely correct for a ‘Desert Storm’ ‘Bug’. Thanks as ever for taking the time to look and/or comment. Well done scheme, nice mix of weapons load for the time frame. 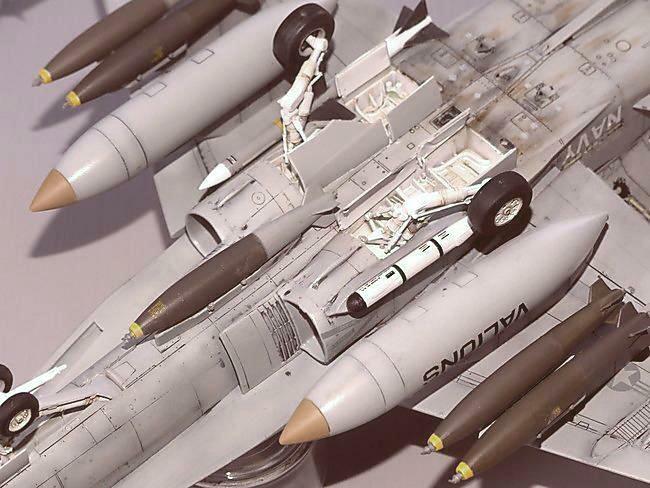 The Gulf War was also during the time when the air to air missiles were transitioning to an overall glossy grey from white. The Navy using both styles during the war. Using up all the white missiles though we didn’t get much of a chance to fire them compared to the boys in blue. (USAF). The weathering is about right for use during combat ops off the boat. Thanks for sharing. Definitely more than 50 shades of grey, great finish. Now, tell us something about the base, Ian. 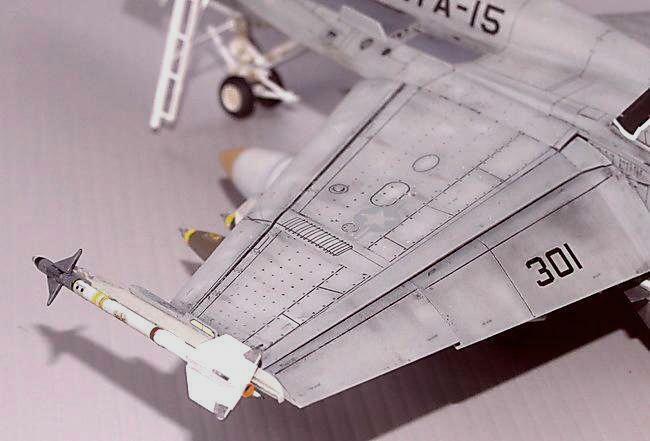 It was built specifically for a Monogram F-106, but never used as the model wasn’t one of my best, if you know what I mean. I’ve kept it ever since and it will be playing host to a 1:32 Mirage sometime in the near future !! 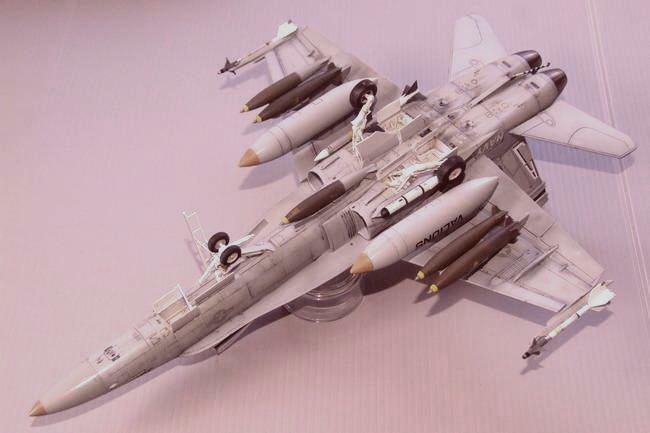 Not sure the Hornet sits too well upon it, but it is pretty striking wouldn’t you say ?? Nicely done. I like the neutrality of the grays. Great weathering, too. 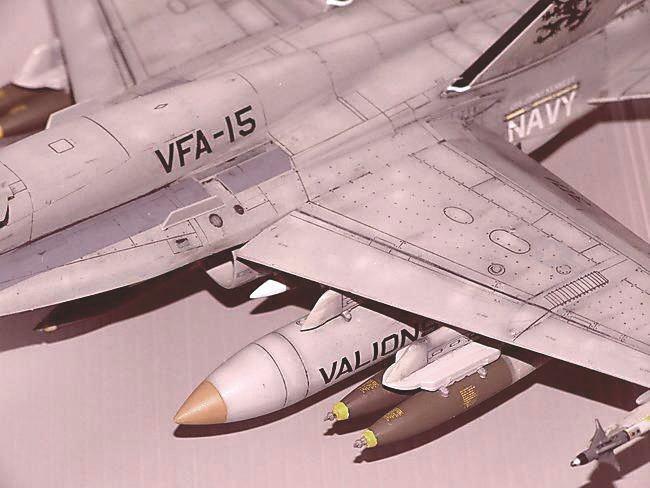 Though more of a fan of the older grey and white US Navy, I can still appreciate a well made and finished model. This is just such a model. That’s awesome Ian! Great painting and weathering! Very nice, Ian. I like the photographic effects, and you’ve clearly thought a lot about presentation with your finishes. Realistic weathering. Very nice work. Top stuff. Outstanding work, Ian! That’s about the most realistic paint and weathering I’ve ever seen on a model. You really nailed it. What scale is this? And you should be pleased! All your shading and weathering efforts paid off beautifully, making an otherwise dull grey scheme come alive with dimension and vitality! Great job. Excellent job Ian! Love the paint scheme. 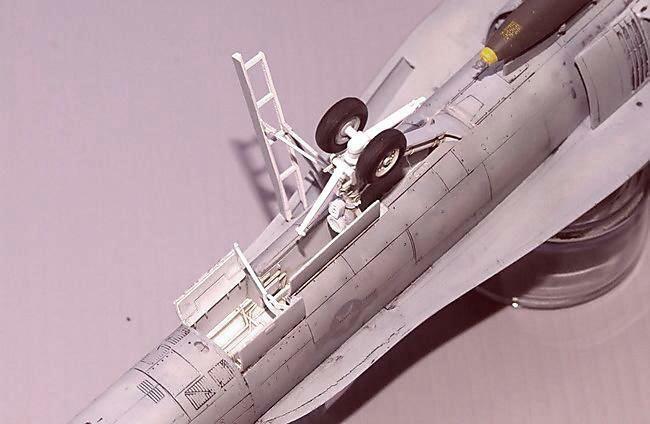 When people talk about “boring grey aircraft” nowadays, no one considers just how difficult it is to create the very subtle weathering effects that exist on them, which is the challenge to us modellers. 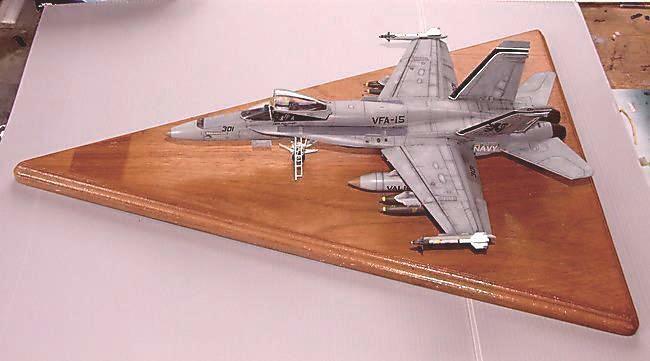 I have done similar on a 1/32 Academy F/A-18C, coincidentally also done as a Valions CAG bird. Like you I am a USN buff too. Keep up the good work! …a ’65 Chevy pick-up !! 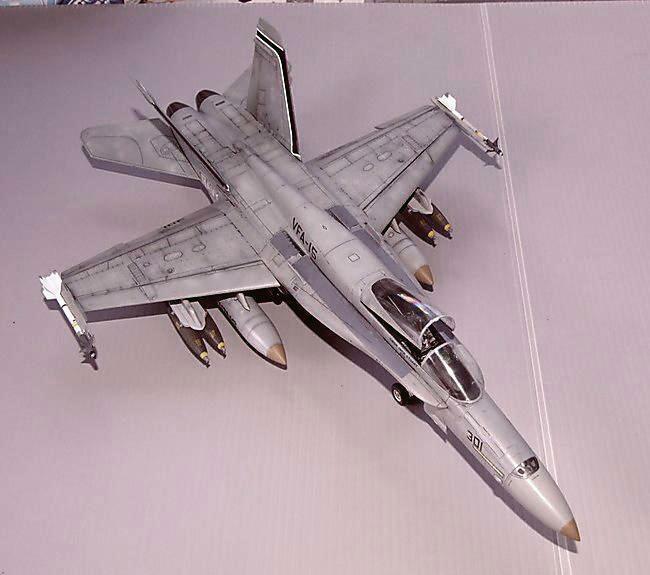 Really like that paint job Ian, good work on that Hornet. Ian, great looking model, very nice finish work, giving a very convincing appearance. Well done ! 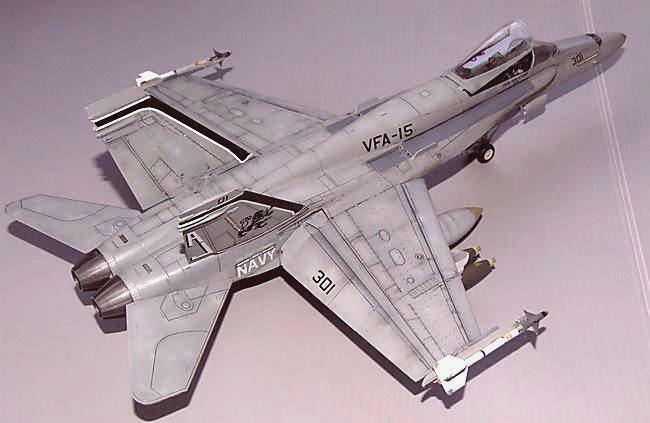 Very realistic paint and weathering. Bravo-Zulu.